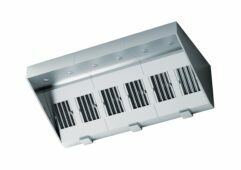 The SmartVent Canopy Extraction System is designed to efficiently remove kitchen smoke and odours, making your kitchen a safer and more comfortable place for staff to work in. A real alternative to expensive bespoke kitchen ventilation, the system is modular in design and robustly constructed. Facing challenging installation deadlines? The SmartVent Canopy Extraction System can help with that. The cost-effective system is flexible, with four different length options, it’s easy to install, and it’s compatible with both gas and electric cooking equipment. Are your staff working flat out to deliver quality fast food around the clock? Keep them cool and safe while they work. Perfect for removing smoke and odours to make for a more comfortable experience for your staff as well as your customers. Ensure that your staff are focused only on delivering the very best quality food by keeping the air clean and clear. Efficiently remove kitchen smoke and odours, making your kitchen safer and more comfortable for staff to work in.